One category of healthy oils, namely, containing single-chain unsaturated fat, and high double chain. Corn oil, including the oil-rich unsaturated fats that can help lower cholesterol, to lower the risk of heart disease. Corn oil is the oil extracted or squeezed out of corn, is half dry, yellowish and is used to make soap, and lubricants. These oils began to smoke at a temperature range of 204 ° C - 213 ° C. Because it is resistant to high temperatures without smoke, corn oil suitable for cooking many foods. Corn oil is often used as an alternative to palm oil because it allegedly has a saturated fatty acid content is lower. Corn oil also has a taste that is almost tasteless. 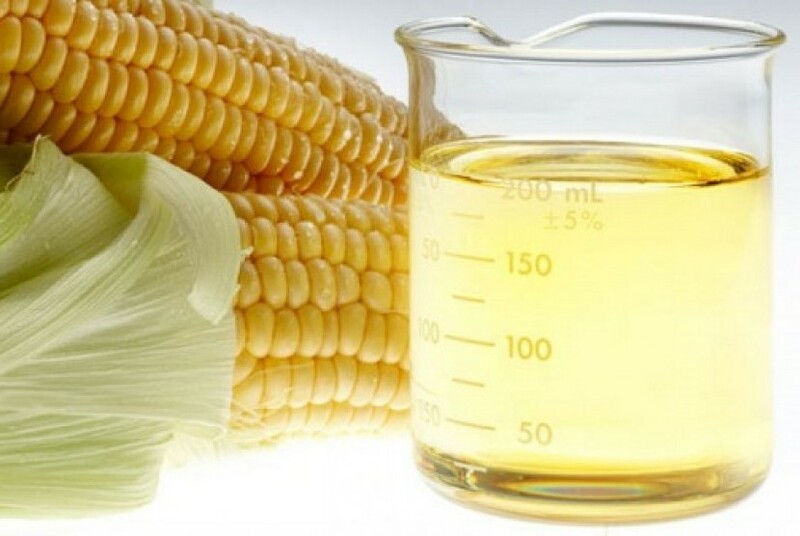 Corn oil contains oleic acid 20% -50%, linoleic acid 35% -60%, 2% and the phospholipid material was saponified 2% (tocopherol, sitosferol and candles). In addition, the substances contained in pure corn oil is 99% triacylglycerols with polyunsaturated fatty acids (PUFAs) 59%, monounsaturated fatty acids and 24% saturated fatty acids (SFA) 13%. Equally important, it also contains ubiquinon corn oil, high alfatokoferol and gamma-tocopherol high so as to avoid the "rancidity" oxidative. Other nutrients in corn oil which is not less important is vitamin E, which is very good for boosting the immune system and also acts as an antioxidant to prevent free-radical damage. Replacing saturated fatty acids with unsaturated fatty acids double chain. Hitting Low-density lipoprotein (LDL) is often called bad cholesterol. Improving the ratio of LDL and high-density lipoprotein (HDL) or good cholesterol, becomes better. Not only the unsaturated fatty acid double chain are instrumental in lowering cholesterol levels, but also unsaturated fatty acids single chain. In addition, unsaturated fatty acids single chain is also beneficial to maintain the stability of blood sugar and insulin levels, thus reducing the risk of type 2 diabetes. Food products derived from vegetables and corn oil contains a lot of phytosterol. These substances can reduce cholesterol, for its ability to block the absorption of cholesterol, including LDL, in the gastrointestinal tract. In fact, small amounts of phytosterols also have an influence on the absorption of cholesterol. A study was conducted to compare the intake of foods containing cholesterol mixed with regular corn oil and corn oil are already removed fitosterolnya. Who eat foods with corn oil without phytosterols, appear to have elevated cholesterol intake to 38 percent. Meanwhile, the consumption of corn oil with phytosterols have cholesterol levels 12 percent lower. This proves phytosterols may reduce the absorption, as well as lowering cholesterol. Likewise margarine made from corn and other vegetable materials, can affect cholesterol levels. One of the suggestions the use of oil from an expert that is, using a combination of various types of oils to maximize benefits to the body. One factor to consider is the boiling point. If the oil past the boiling point, then the oil will appear smoky. If that happens, then the content of nutrients will decrease and cause a bad taste in the food. For corn oil, soybean oil, and sesame oil suitable for frying process because it has a high boiling point level. Meanwhile, canola and olive oils suitable for frying process in a moderate temperature. Then, the oil from flaxseed or walnuts, are best presented as a mixed salad or a meal without cooking process. For those who have a problem of high cholesterol levels, can utilize corn oil as an alternative to fat intake. If necessary, combine several other oil types in order to get the maximum benefit.